A Team Fairchild KC-135 Stratotanker participated in air refueling training and support to the KC-46 Pegasus over Washington state Jan. 22. This first-of-its-kind event for an AMC KC-135 with an AMC crew enabled completion of the training required to successfully deliver two KC-46s to McConnell Air Force Base this week. The flight focused on providing hands-on experience connecting and dispensing fuel to the KC-46, the new generation air refueling aircraft from Boeing Field, allowing the two AMC pilots and three AMC boom operators aboard to work with the Air Force's latest addition to the air refueling fleet for the first time. 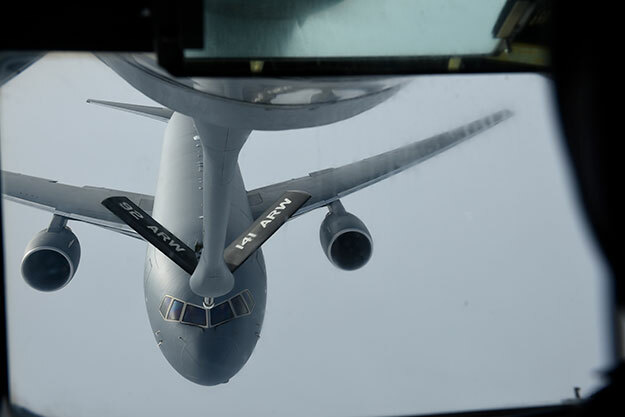 "Anytime you have a new (aircraft) system come online, it is imperative to train like you fight," said Lt. Col. Matthew Dibble, 384th Air Refueling Squadron commander. "Team Fairchild had the opportunity to get exposure to a KC-46, a great opportunity for the pilots and booms to gain insight on its flight characteristics to pass on to their peers." The KC-46 was accepted by the Air Force and the first two aircraft were delivered to McConnell AFB, Kansas, Jan. 25. The KC-46 builds on the capabilities of other refuelers such as the KC-10 and KC-135. The KC-46 can be refueled mid-air, and has enhanced communication, self-protection and situational awareness capabilities. "It was exciting to refuel an aircraft that nobody in AMC has before," said Airman 1st Class Tristen Lang, 384th ARS boom operator. "As a ‘baby boom' fresh out of training, it was an honor to get my hands on it first." "It's cool to see up-close," Lang said. "I was in communication with the KC-46 crew and we all had to figure out this new craft in real-time." The flight was the first active-duty training mission of many to come for Fairchild as the Air Force begins to receive more KC-46s and prioritize training crews to work with it. "We accomplish missions like this to demonstrate the capabilities of the new tanker and allow for training and proficiency for all involved," Dibble said. "That is the reason we are the most lethal Air Force in the world; our aircrews are the best trained, anywhere."